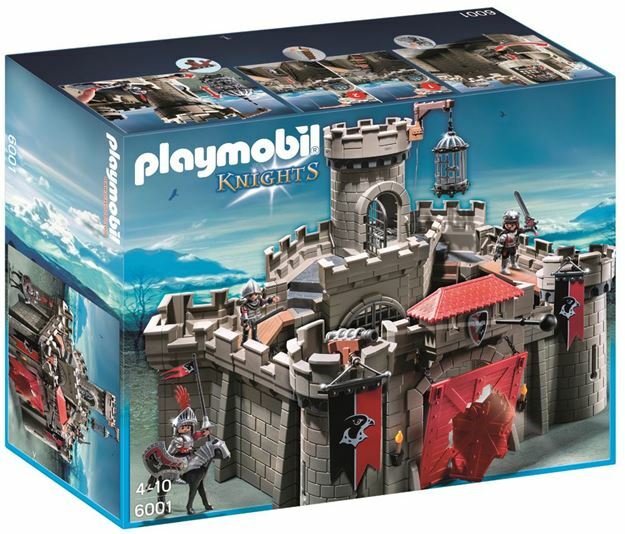 Secure your royal empire from unwanted visitors with the Playmobil Hawk Knights' Castle. Children will love using the secret staircase, secret trap door, and secret treasure hiding place to guard valuable goods and hide from sneak attacks. Beware of enemies trying to breach the walls through the weak spot in the functioning drawbridge. If an adversary infiltrates your kingdom, catch him and throw him into the prison cage to teach him a lesson. Defend against the remaining enemies with the cannons, swords, and bow and arrow. Includes: 3 figures, multi-story castle, horse, shields, swords, cannon, prison cage, banner, ladder, bow and arrow and accessories. Part of the Knights range. Age 4+ years. Distributed in New Zealand by Holdson.